How To: Styling Sweatpants — The Avenue Magazine. Sweatsuits have come a long way since velvet Juicy Couture sets and Uggs circa 2007. Though a similar concept, sweatsuits have evolved and tightened up over the years. In addition to the Kardashian, Jenner and Hadid sisters, celebrities like Cara Delevingne, Selena Gomez, and Taylor Hill don this stylish sweatpant streetwear look regularly, reflecting their own personal style. For example, Kylie Jenner favors heavy fabric two-piece loungewear sets with a curve-enhancing fit, as evidenced by offerings from her online Kylie Jenner shop. 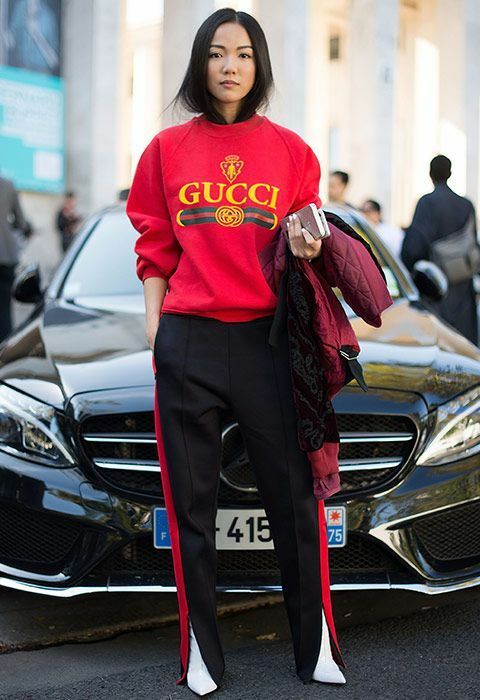 High-fashion designers like Gucci and Alexander Wang’s T by Alexander Wang line embrace this runway-ready athleisure style with a hefty price tag. However, you can recreate similar styles at a lower price, thanks to stores such as TJ Maxx and Marshalls. Athleisure fashionistas Zendaya, Rihanna, and Beyonce have experienced different responses to their clothing lines. Zendaya recently cut ties with the company that was operating Daya by Zendaya due to management, while Rihanna’s Fenty Puma line has thrived in footwear and apparel. Beyonce uniquely only offers Ivy Park at retailers Topshop and Nordstrom, but past-season leftovers can often be found at Nordstrom Rack. Draw inspiration from sweatsuit queen Rihanna to sport a power look, accessorizing with jewelry and heels in a cropped top set or separates. Street style sweatsuits can work with cage heels, stilettos, boots, or honestly whatever you want. Or stick with a more casual chic approach and choose sneakers instead. The Nike Roshe One shoe and the classic Adidas Original Superstar sneakers are always a safe bet, but if you want to stand out from the crowd, consider expanding your horizons. Another option is to substitute leggings for joggers or track pants for a similar edgy but sporty look. Approach this look however you like, or meet somewhere in the middle of weekend-ready and loungewear. One simple way to convey your “fashion mood” or personal style is by mixing up your top layers, choosing a plain or graphic tee, bodysuit, cropped top, sweater, or tank top, or whatever your desired creative approach. The beauty of joggers is their versatility. They’re stylish and comfortable without being overbearing. 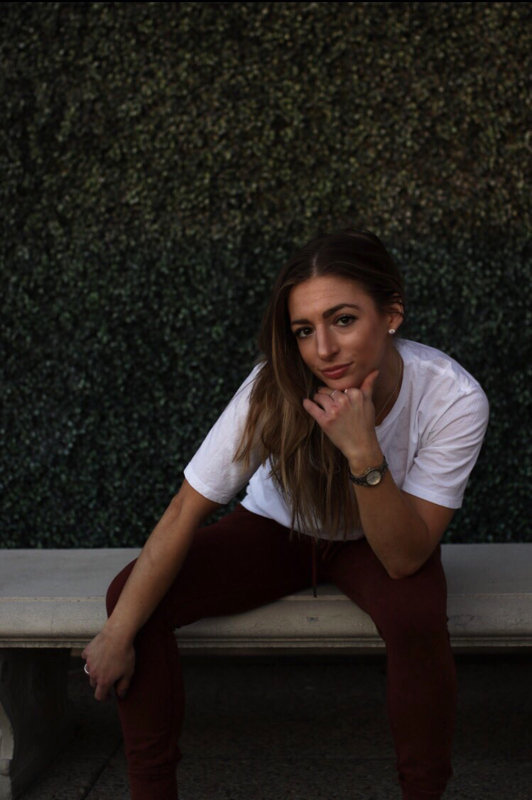 Joggers typically don’t have an oversized, “drowning-in-these-pants” sweatpants look, which gives them this freedom and a cleaner look. Similarly, with track pants, updated styles channel a sleeker look. Matching sweat suits used to be all about flared bottoms, an oversized fit, and a full zip style. In 2018, it’s quite different. Modern style took the matching warm-ups look and made it more crisp, integrating separates into outfit choices more frequently. For example, Bella Hadid sports a slightly slouchy jacket and slimmer leg track pant, compared to the fitted sweatshirt and flared pant look from the early 2000’s. Plus, it’s nice to wear pants you won’t trip over, due to the switch from baggy to a more tailored look. 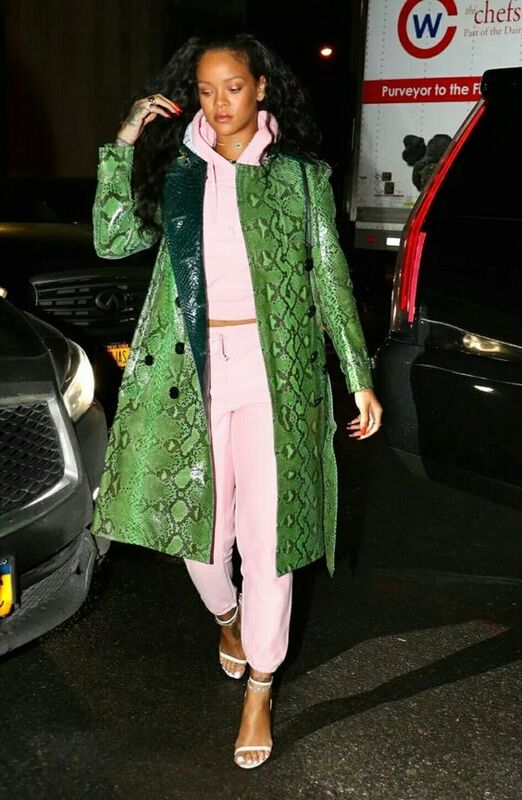 Like the revamped track pants style, Rihanna makes the classic overhead sweatshirt and drawstring sweatpants combo look more chic with a slimmer full-length cut. Wearing hoodies and sweatpants under winter jackets is also a go-to outfit choice for celebs like Bella Hadid and Jourdan Dunn, who dresses up her athleisure style with ankle boots. Oftentimes, the jacket makes the outfit. Joggers topped off with bombers and crop tops or leather jackets are another street style favorite. What’s awesome about this look is that you can create it with clothing you already have in your closet. And if you don’t, I’d advise you to consider investing in the following casual clothing items, as they can all be mixed and matched so seamlessly: Joggers, track pants, a leather jacket, and a bomber jacket. Stick with minimalist looks for versatility. Getting caught up in trends of the moment can be tempting-- but keep in mind that for example, lace embroidered denim jackets might not be “in” next season. Current trends for joggers, sweatpants, and leisurewear include matching sweatsuits, monochromatic looks, mismatched sets, and trendy jackets. There are so many ways to pull off this look. Channel your inner 2001 J. Lo TRL with powder pink leisurewear, or Gigi Hadid’s blush streetwear getup for a soft, feminine look. While monochromatic styles are timeless, investing in basics and neutral colors is smart, as it allows more versatility to mix and match. Take another page out of Gigi’s book and layer a leather jacket over a groufit (gray outfit) for an edgy twist. Alternate with a statement jacket (sequins, patterned, fur, etc.) to spice up your outfit. Or, keep it simple: Zendaya sports black sneakers, black track pants, a gray t-shirt, and an olive green bomber for her jet-set airport style. The goal is to make your outfit look purposeful and functional-- not like you threw on the nearest pieces of clothing when you overslept this morning, claiming “it’s the look” when your others question your disheveled wardrobe choices. This look isn’t about being eccentric, absurd, or disruptive to an on-looker-- it’s about successfully executing a look that’s put together and comfortable. You’re not trying to push the envelope with how bizarre you can make your outfit combinations. 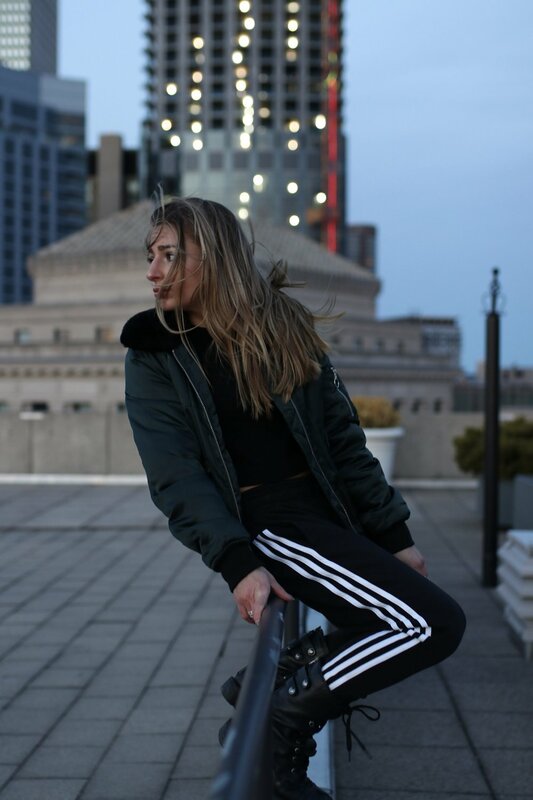 Striking the right balance in looking put-together while feeling comfortable, sporting street style sweatpants looks encourages others to be more adventurous in their wardrobe choices, and look for fun ways to fuse cozy and composed. This may sound cliche, but the sexiest part of this look is wearing it with confidence. You can show some skin by adding a cropped, low-cut, or shoulder-baring top, but the attraction lies in your ability to mix comfort with style in an effortless way.